[handwriting] The view from the top of the South Hill. Portland to the left in the distance and East Portland to the right. 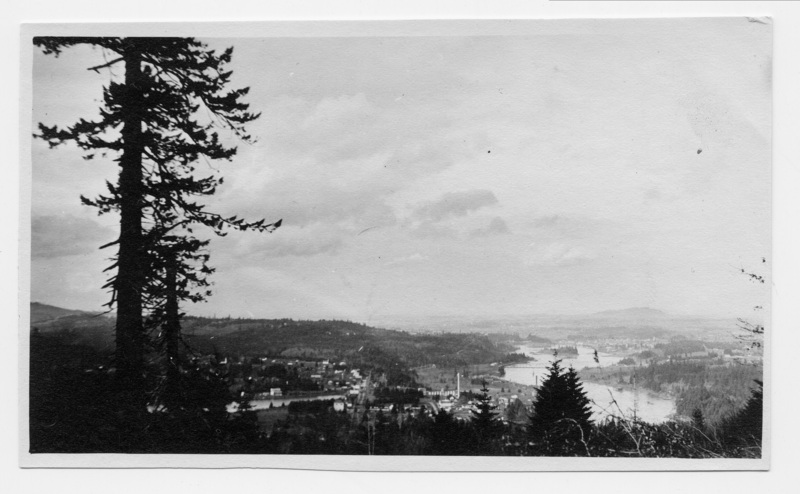 The Willamette river [sic] right and the duck pond at the left. Oswego in the foreground. Cement works stack and raw rock silos in the foreground. The hill is about 200 or 300 ft. high and you can see miles over Portland. It was a cloudy day when I took this. Description Perhaps 1916 because of similarity to photo #490. Scanned as b & w.
Transcription [handwriting] The view from the top of the South Hill. Portland to the left in the distance and East Portland to the right. The Willamette river [sic] right and the duck pond at the left. Oswego in the foreground. Cement works stack and raw rock silos in the foreground. The hill is about 200 or 300 ft. high and you can see miles over Portland. It was a cloudy day when I took this. Physical Description H 3.25" X L 5.25"